"Kylie Jenner," by Merudjina Normil; submitted photo. In the wake of the November election, people across the country have seen fear and anger and exclusion become part of a national public conversation. Many people are sharing the experience of feeling that they do not belong in their familiar places. It’s called othering — making someone feel pushed to the edges, unwanted or different. It can happen in daily meetings and conversations, at work, at school, even at home. In the Berkshires, movements are growing in response, art and lectures and performances and rallies, to explain what othering means and what it looks like — and to draw people together instead. “Eyes Opaque With Terror,” by Marcelene Mosca and Freya Segal; Mixed Media, 2014; photo by David Edgecomb. People are saying in different ways, I feel threatened. I feel alone. And people are saying that hate is not mine. I want to stand with you. I want to live in a country where we can all live and love and work, pray or not, speak and play music. People are saying we need to talk to each other. In the Berkshires, efforts are growing to bring people together. In Pittsfield, on a November afternoon, young WordxWord poets and storytellers reflected on how it felt to be excluded or pushed to the edges, as part of “Othering,” a month-long show curated by the Berkshire Art Association at the Lichtenstein Center for the Arts. 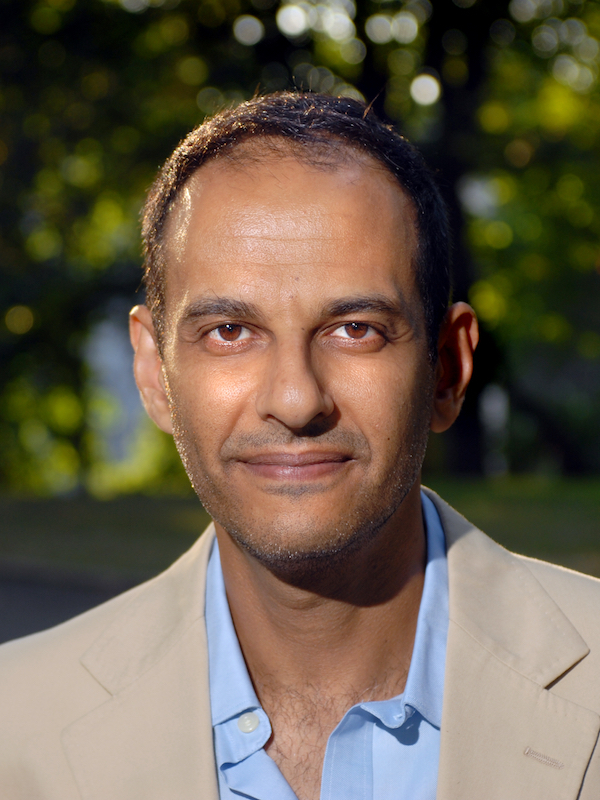 In Great Barrington, Asma Abbas, Associate Professor of Politics and Philosophy at Bard College of Simon’s Rock, invited Moustafa Bayoumi, American Book Award–winning writer and professor of English at Brooklyn College — who wrote one of the most re-tweeted tweets of the 2016 USA presidential debates, according to Twitter—to speak about Muslim American experiences in the last 15 years. In North Adams, Rabbi Rachel Barenblat, the spiritual leader of Congregation Beth Israel, joins Rabbi David Markus, her co-chair of Aleph, the central organization of the international Jewish Renewal movement, in a call for solidarity. If a national effort to register Muslims becomes real, they are calling on all Americans to register. 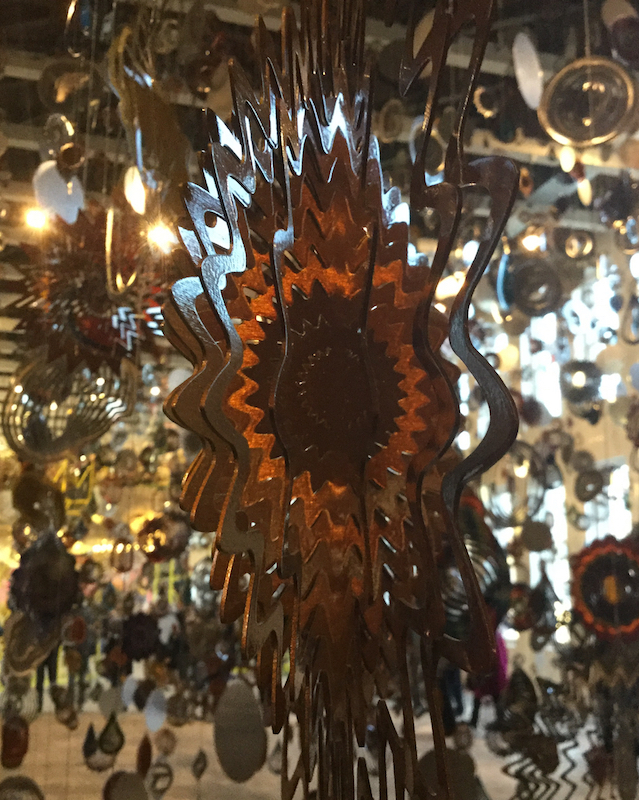 One of 16,000 dangling items in MASS MoCA’s Rauschenberg gallery that are part of the installation, “Until,” by Nick Cave, on view through August, 2017; photo by Kate Abbott. Soprano Brenda Wimberly and organist Sereca Henderson perform at the opening of Nick Cave’s ‘Until,’ at MASS MoCA. His installation fills the Rauschenberg gallery, and everyone who walks in stops at the doorway. The room is as large as a football field. And it is full of light. It’s like walking into an optical mobile. It’s a maze of stars and spirals and suns on 16,000 strings. They spin like tops, and they transform from pinwheeling color to faint lines, until they become invisible. In some of them, at the core, he has set the image of a hand gun. Nick Cave is known for Soundsuits, wearable sculptures that cover the whole body, and he often performs in them. But here he has created something new. It’s a landscape. It’s a cloudscape made of chandelier crystal. It’s a place where he invites other people to perform. Benjamin Clementine gave a concert on opening night. Nick Cave created this installation holding in mind the lives and deaths of Eric Garner, Oscar Grant, Trayvon Martin, Tamir Rice, Yvette Smith and Michael Brown and more like them. Mass MoCA curator Denise Markonish speaks about his work. Moustafa Bayoumi has explored the concept of Othering in both How Does It Feel to Be a Problem? : Being Young and Arab in America (2009) and This Muslim American Life: Dispatches from the War on Terror (2015); photo by Neville Elder, courtesy of Moustafa Bayoumi. Coltrane often performed with Muslim musicians, he says, and anyone with an ear attuned to Islamic influences can hear them in Coltrane’s words and music. Moustafa Bayoumi is an internationally recognized journalist. He is a columnist for The Guardian; his writing has appeared in journals from the New York Times to the Nation; and he has appeared on CNN, FOX News, National Public Radio and many other media outlets around the world. Emily H. Fisher Faculty Fellow at Bard College at Simon’s Rock; photo courtesy Asma Abbas. “How Does It Feel to Be a Problem?” takes its title from writer, Civil Rights activist and Great Barrington native, W.E.B. DuBois, who asks that question in Souls of Black Folk. In his book, Bayoumi tells the stories of seven young men and women in their 20s living in Brooklyn after 9/11. Rasha and her family were imprisoned without trial and without evidence; Sami served in the military in Iraq; Yasmin fought discrimination in her diverse high school — and won. 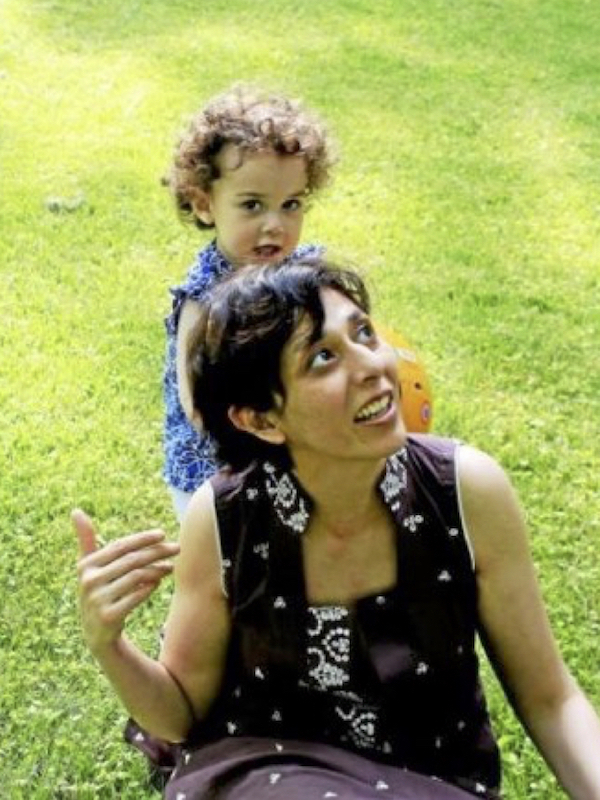 In December, professor Bayoumi came to Bard College at Simon’s Rock in Great Barrington to talk with professor Asma Abbas, and her students and the community, about the experience of being Muslim American in the past, in the last 15 years and today. Many Americans misunderstand a great deal about what Muslim Americans believe and how they live their lives, he said. To begin with, Muslim Americans have lived in this country for almost 400 years. Jewish Renewal, founded by Rabbi Zalman Schachter-Shalomi, is a movement across Jewish denominations. At its center, Aleph includes a rigorous liberal seminary and a growing network of congregations and communities around the world. In response to the U.S. president-elect’s campaign promise to require all Muslims to register with the government, Aleph has sent out a call to all Americans, if that day comes, to register as Muslim in solidarity. That call comes out of values central to Renewal, Rachel and David say, from a respect for all faiths, and a core Jewish value (Lev. 19:18), to love your neighbor as yourself. The experience of being treated differently — the ‘Othering’ that David Markus talks about — is also the name of the Berkshire Art Association’s biennial juried show. In November, it filled the Lichtenstein Center for the Arts in Pittsfield with abstract paintings, collages and drawings. The art association sent out a call for work reflecting on experiences of exclusion and separation. More than 30 artists from throughout the Northeast had work in the exhibit — from a twenty-year veteran of the U.S. military who served two tours in Iraq to an African-American Pittsfield High School graduate now studying art at Williams College. On Nov. 13, the Pittsfield organization WordxWord hosted an afternoon of poetry and storytelling on the same theme — WordxWord uses spoken word, poetry and storytelling to celebrate diversity and creativity and make connections. 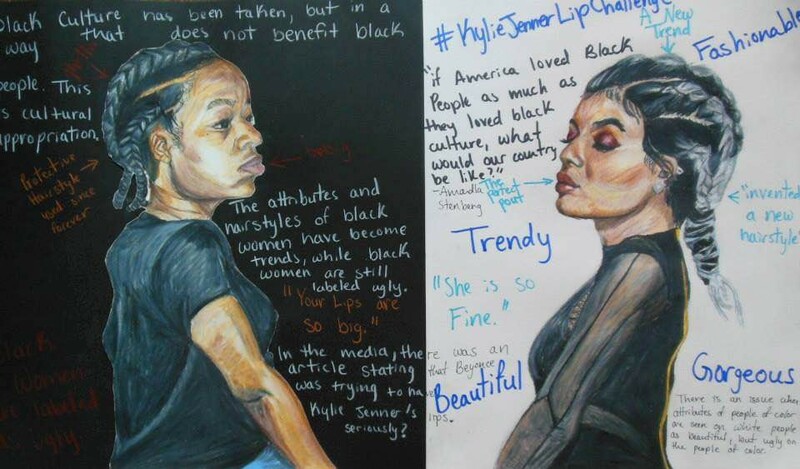 “Kylie Jenner,” by Merudjina Normil; Drawing, 2014; submitted photo. Four of those poets have given us permission to share there work here. We thank Izzy; our second poet, who has asked to remain anonymous; Sage; and Doni Smith. 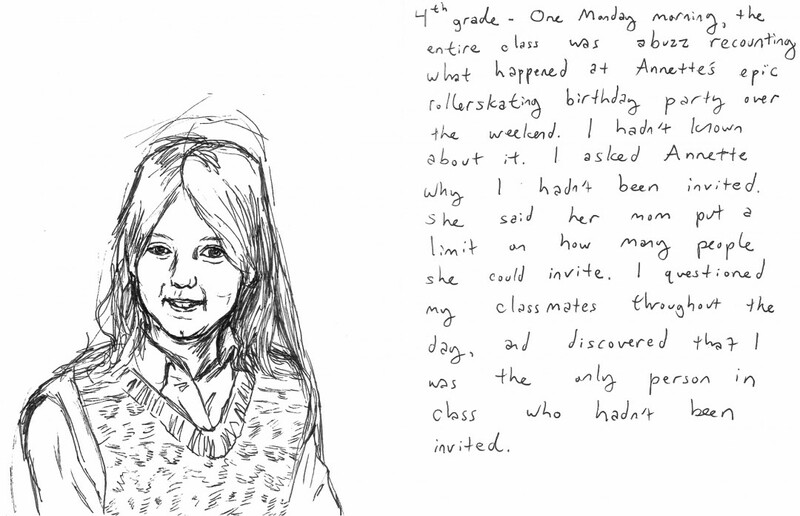 “This Is Normal: 4th grade,” by Dina Noto, Ink Drawing, 2016; submitted photo. On Saturday, Jan. 7, on the 76th anniversary of Franklin Delano Roosevelt’s Four Freedoms speech, a new Four Freedoms Coalition will invite the Berkshire community to unite against hate and bigotry in all its forms. The Berkshire County branch of the NAACP, BRIDGE, Berkshire Immigrant Center, United Africans of the Berkshires, and the United American Muslim Association of the Berkshires and others will gather for a rally and march in downtown Pittsfield. On Jan. 29 at 3 p.m., Doni Smith and WordXWord will welcome the new year with a free poetry reading to celebrate sharing and caring and reflect on the consequences of greed at MCLA’s Gallery 51, at 51 Main St., North Adams. Nine days after the presidential inauguration, poets and spoken word artists will bear witness to a world where greed appears to have no limits, and yet every day holds moments of generosity and compassion. The event will accompay Josh Ostraff’s exhibition, OFA ATU, which opens Jan. 26. Also in Pittsfield, Georgene Poliak has formed All Band Together as an initiative in compassion and solidarity. At the holiday Shindy at Shire City Sanctuary, she showed arm bands with a crescent and a star that she is making out of upcycled t-shirts and sweaters. They recall the bands that Jews in Europe were made to wear under the Nazi occupation. But these mean the opposite — they mean that people of many faiths can stand together. And in the spring, new artists will come to Mass MoCA to create and perform work inspired by Nick Cave’s ‘Until.’ Internationally acclaimed dancer and choreographer Bill T. Jones will present a new solo work on March 4. And choreographer, writer, and actress Okwui Okpokwasili will create and offer a site-specific dance on April 7. Okwui Okpokwasili “Bronx Gothic” trailer from Peter Born on Vimeo. Grammy-winnter and living legend Mavis Staples, known worldwide as a voice in R&B, Gospel, Soul, folk, rock and blues, will also perform at Mass MoCA on March 25. And Toshi Reagon and Dorrance Dance will return to the ’62 Center at Williams College with tap masters Derick Grant and Dromeshia Sumbry-Edwards. The Jewish Federation of the Berkshires to host Israeli Jewish and Arab women artists in an exhibit of the Olive Tree Project, a story of coexistence and shared society at the Berkshire Museum. PITTSFIELD, Mass. 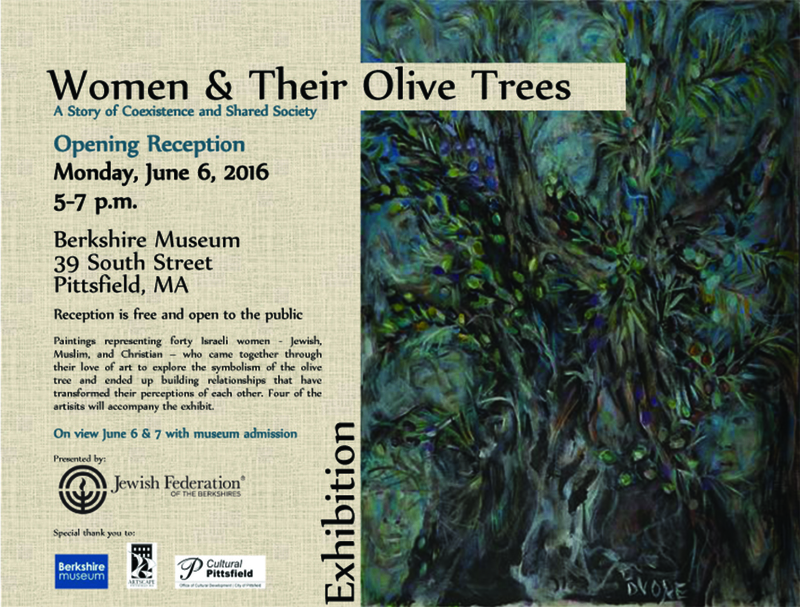 — The Jewish Federation of the Berkshires, in partnership with the Berkshire Museum, will present a community exhibition of Women and Their Olive Trees. The exhibition will be on view at the Berkshire Museum on Monday and Tuesday, June 6 and 7, with an opening reception on June 6 from 5 to 7 p.m. The reception is free and open to the public. The exhibition represents the art of 40 Israeli women from diverse cultural and religious backgrounds – including Jewish, Muslim, Christian, and Circassian – who through their love of art have created an environment of tolerance, friendship, and sharing. Olive trees are the subject of the exhibition, and the uniqueness, personality, and perspective of each artist is reflected in the 25 oil paintings on view. The women painted together, sharing their life experiences and cultures to create unique and symbolic pieces of art while building relationships that have transformed their perceptions of each other. Four of the artists, two Jewish and two Muslim, will accompany the exhibit, which has been on tour throughout Europe. This past March, it opened at the United Nations at the Palais des Nations in Geneva, Switzerland. 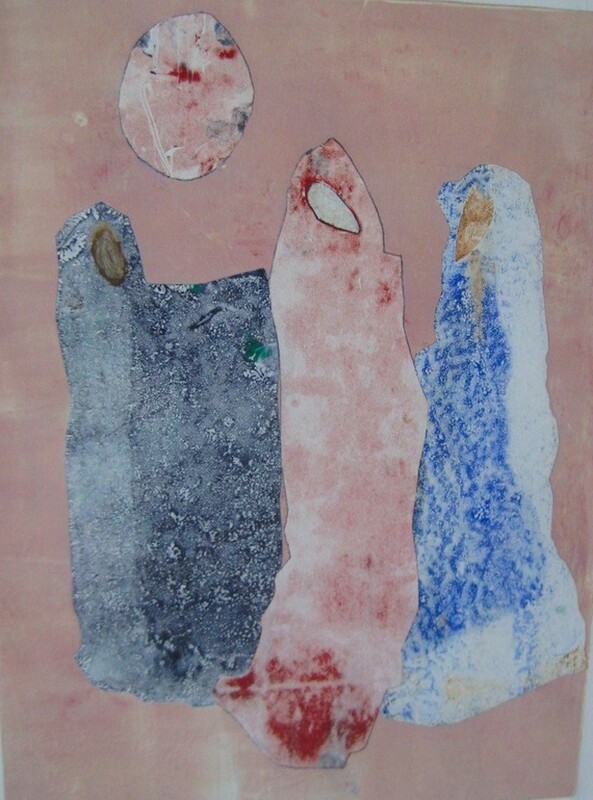 The exhibit is part of the Olive Tree Project, a year-long art program of the WIZO Afula Community Center that draws women artists from the Northern Israeli cities of Afula and Nazareth and the surrounding Arab villages. “Just as each tree is different from the other, human beings are different, too, and the olive tree is an inspiration”, says Guila Cohen, one of four artists who will travel with the exhibition and meet with the community while in the Berkshires. “It was important to me to make a connection though art and painting, and to find women artists who wanted to have open dialogue, to connect with and to learn from each other.” This is the message of coexistence that Mrs. Sheila Dvor Casdi, curator of the exhibition, wanted to carry through when she and Daniel Benn, director of WIZO Community Center of Afula, first conceived of the project in 2013. The Olive Tree Project is one of a number of living bridge programs planned in the Berkshires as part of the Jewish Federation of the Berkshires’ newly established partnership with the Afula-Gilboa region of Northern Israel. As part of Jewish Agency for Israel’s Partnership 2gether Peoplehood Platform, the Berkshires joins more than 450 global Jewish communities that are linked with 46 city-to-city and region-to-region partnerships in Israel. The Jewish Federation of the Berkshires mobilizes the local Jewish community to care for those in need, and nurtures and sustains Jewish life across the Berkshires, in Israel, and around the world. For more information, visit jewishberkshires.org or call (413) 442-4360.